Born in Winnipeg, he played junior with the Monarchs and Portage Terriers. He played in England and then went to St. Catharines for a promised job and spot on the senior team. By 1942, he had set up a junior club in St. Catharines. His team made the playoffs the next three seasons. In 1946 he moved to Buffalo as a scout and promotions assistant. He went to Houston to help them win the USHL title. Buffalo then sent him to San Diego Skyhawks, who won the 1949 PCHL title. He managed/coached two Memorial Cup winners in St. Catharines (1954 & 1960). He coached the Chicago Black Hawks to the 1961 Stanley Cup. 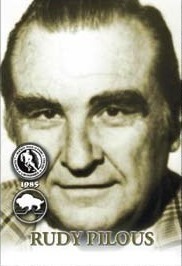 In 1964 he managed/coached the WHL champion Denver Invaders. He managed the WHA champion Winnipeg Jets in 1976 & 1978. Rudy Pilous later scouted for Detroit and LA and was GM of Toronto's farm team in St. Catharines.